Today, Lakeside will partner with #GivingTuesday for the fifth time. 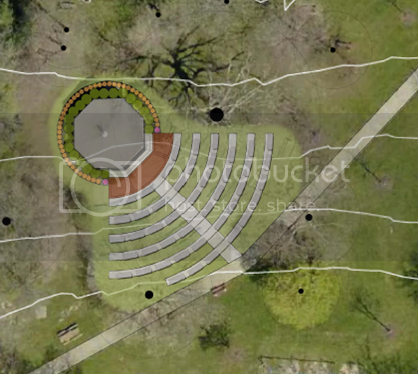 This year, we've set a goal of revitalizing the Steele Memorial Bandstand/Gazebo. The Gazebo has been a gathering place for nearly four decades; a site for countless concerts, open-air author visits, planned marriage proposals, a variety of family celebrations and more. Because of its noteworthy location in Central Park,it's often the perfect spot to simply soak in the summer. much-needed repairs and additions to the facility. These updates will not only help the structure maintain its beauty, but will increase its functionality. To improve the aesthetics, we plan to add a fresh coat of white paint. The 270° landscaping will be updated with new shrubs and perennial flowers, and containers of annuals will also be added at the entrance. While the low-to-the-ground and open stage already provides an intimate venue for concerts, speakers and weddings, we're investigating a step extension and paver system that would allow those on the stage to step down and be closer to the audience. New benches will be purchased and placed on concrete strips, and the gravel underneath will be removed and replaced with grass. Lastly, fresh grass will be planted all around the structure to provide an even ground. Lend a hand this #GivingTuesday, and help us revitalize this special place along Ohio's Most Beautiful Mile. Make on online donation today. We invite you to share with your friends on Facebook, Twitter and Instagram about how you're celebrating this important day of giving. Join the conversation by using the hashtag #GivingTuesday.